Insurance companies are finally putting a price on the risk of distracted driving, and it’s relatively cheap. Last year, a ticket for using a mobile phone while driving added $226 to the average insurance policy, an increase of 16 percent, according to a new analysis from Zebra, a Texas-based startup that helps consumers weigh insurance rates. That’s up from just $23 in the span of two years, but still a lot less than some other violations. Underwriters deem a range of relatively innocuous incidents and conditions far more dangerous. Driving too slowly, for instance, draws an average premium penalty of $345 a year, while passing a school bus will cost an additional $386 a year. 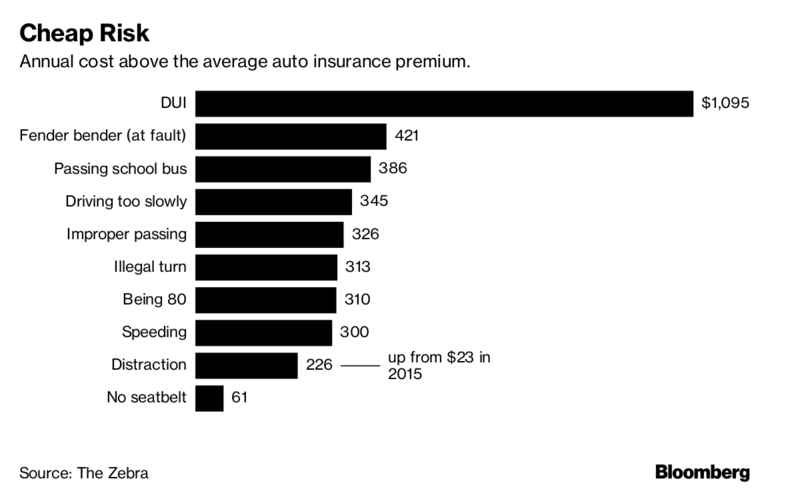 Being old or being young is pricey, too; 80-year-old drivers pay about 22 percent more than the average driver, while 18-year-olds (or their parents) have to fork over almost three times the national average for coverage. Underwriters seem skeptical of safety technology as well. On average, U.S. auto insurers won’t reduce rates for vehicles that have blind-spot warnings, heads-up displays and systems to monitor driver alertness, according to the survey. To be fair, raising insurance rates is a lengthy, bureaucratic process. The industry is regulated at the state level, so underwriters have to make their case for any risk reevaluation in every state they sell policies. Those arguments are best made with supporting data, which has proven scant when it comes to distracted driving. 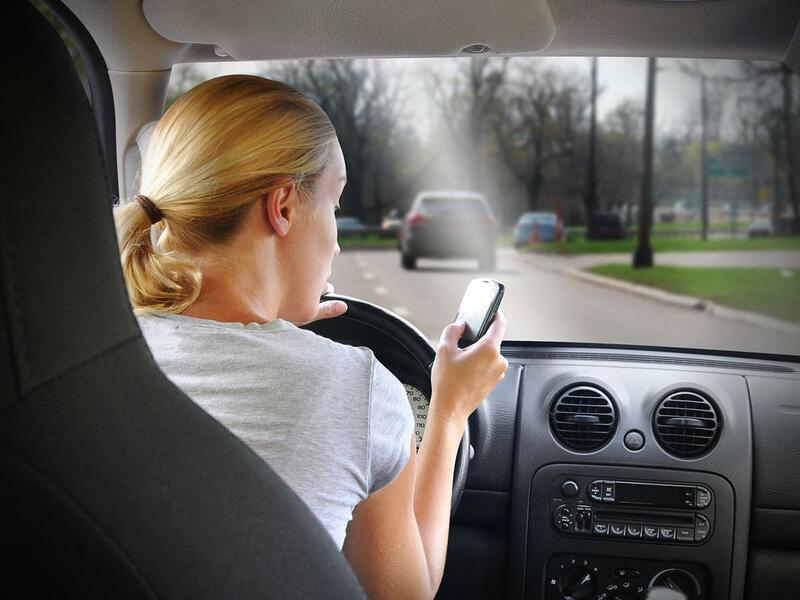 Nobody, including federal safety regulators, has any decent idea yet how many people are using phones at the wheel—and how many accidents that behavior precipitates. That said, traffic fatalities have spiked in sync with smartphone adoption. unlike driving while drunk, an ill-advised text is tough to spot from a police cruiser, and accident report forms in many states still lack boxes in which an investigator can tag a crash catalyst as distraction. “Underwriters don’t have the tools to measure the risk properly,” explained Phil Renaud, executive director at the Risk Institute, an Ohio State University think tank. Renaud said he expects the industry to catch up quickly, primarily with embedded technology of its own. The actuarial future will likely resemble the practices of Root Insurance Co., an Ohio-based startup that insures drivers only after they have downloaded an app that tracks their behavior at the wheel for a few weeks. Root, which operates in 16 states, said its policyholders pay up to 52 percent less than average because the company doesn’t let bad drivers sully its risk pool. “The better driver you are, the better your rate will be,” it promises. Root has seen an increase in distracted driving, despite new laws and more robust enforcement. A few months ago, the company added mobile-phone use to its risk metrics, alongside speeding and hard braking. It found roughly that 80 percent of the people taking its “test drive” were texting or talking at the wheel, according to co-founder and Chief Executive Officer Alex Timm. Root quickly tuned its risk model to make distracted driving a bigger factor. As it monitors customers, it recently started sending surcharges to drivers who used their phones and sending discounts to those who didn’t. Timm, who rose through the ranks at Nationwide Mutual Insurance Co. before starting Root, said a slowness to adapt among larger competitors is tied to a fear of losing customers. After all, those who experience high rates for a distraction violation can still find an insurer that won’t penalize them nearly as much—at least, for now.